Unique Oceanfront Villa available with two or three bedrooms. Pricing is for two bedrooms. Additional separate one bedroom unit may be rented for additional charge. Layout allows a family to occupy the upstairs 2BR/2BA, with grandparents or extended family downstairs in the 1BR/BA. Upstairs is an elegantly furnished, two bedroom, two bath home with fully-equipped kitchen, dining room, and living room. Master has king-size bed and view of the ocean. Second bedroom has one twin trundle beds and a Queen sized bed (sleeps four). Each bedroom has its own private bath. Spacious deck for eating and sunbathing. The one-bedroom unit has a full kitchen, dining area, and living room. Queen bed sleeper sofa sleeps four. Full ocean view and a few steps from the sandy beach. Washer/dryer available to both units. Single-car garage for storage including chairs, umbrellas, and bikes available for renters use. Units can be rented separately or combined as one large unit. Pricing is for two bedroom! Beautiful wide beach closed to driving and five miles north of the National Canaveral Seashore Park. This villa is part of a group of ten villas that share a tennis court and pool. Quiet, private, and secluded. Tom & Deborah live in Orlando. We sell real estate in downtown Orlando and New Smyrna Beach. When we were younger, my wifes parents had a unit at Sea Dunes. 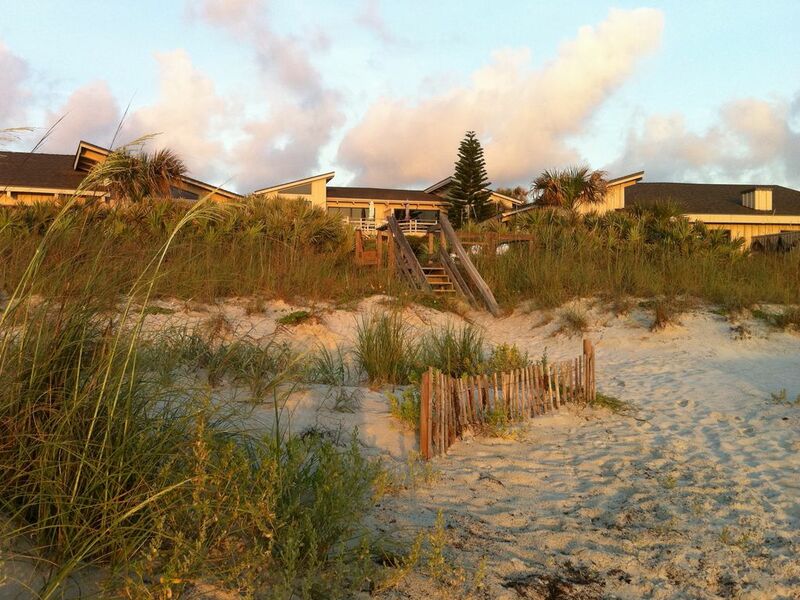 We always said that if we could ever afford a second home, we would come back to Sea Dunes. In 1998 we were fortunate to purchase our home. We love the privacy! Its like having your own home on the beach. Great place to relax. Our setup allows an extended family stay together. Grandparents downstairs, Children and grand children upstairs. Security Information supplied with rental! My first time in this unit but second time in Sailfish. Very enjoyable stay, condo was very nice and very well stocked. Would highly recommend! Great location, very nicely furnished. Comfortable beds. Couldn’t have asked for better. The owner was communicative and straightforward. The beach was just down a short wooden walkway. The beach itself is broad and a great place for kids to play. We really appreciated the laundry facilities, too. We have visited this property several times and have never been disappointed! This location is great for families - the "no drive" beach is safe for little ones, and the downstairs apartment is great for family members who are not fond of stairs. Thank you Mr. and Mrs. Cook for another great stay! Sea Dunes was gorgeous and Tom was a most gracious host. Our family vacation was wonderful. It was a pleasure to have you stay with us! Come back! Great views beautiful condo equipped with all you need for a fantastic beach vacation! We truly enjoyed our week in New Smyrna Beach... all 27 of us! Price quoted is for the upstairs 2 BR / 2BA unit. The 1BR / !BA unit downstairs may be added for an additional $500/week. Total price for the combined up and down unit is $2100/week, plus taxes, cleaning and service fee.